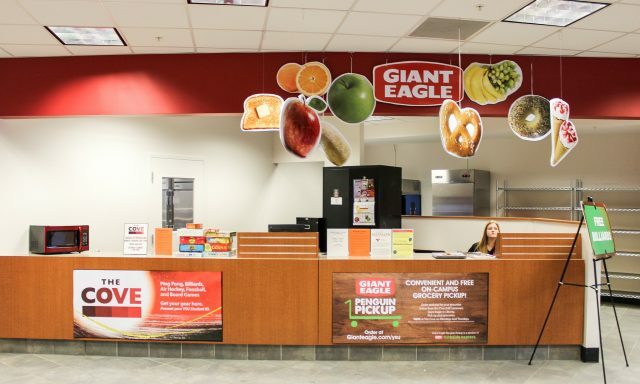 Youngstown State University is partnering with Giant Eagle to provide students with a fast and simple curbside grocery delivery service on campus. This service allows on-campus and commuter students to order their groceries through the Churchill Commons Giant Eagle in Liberty with a required $35 minimum purchase. Orders can be placed using a debit or credit card and students can sign up at www.gianteagle.com/ysu. When students sign up for the service, they are encouraged to use their student e-mail address to receive delivery notifications immediately. Vaughn Myers, associate director of Kilcawley Center, said Giant Eagle has agreed to waive any delivery fees, and the groceries will be delivered on Mondays and Thursdays to the Cove in Kilcawley Center. Myers said the number of orders placed will be limited in the beginning, but as the curbside delivery gains more interest, an expansion of orders will be made available. According to Myers, the idea for curbside grocery delivery came together when Michael Cardwell, assistant director of retail of Kilcawley Center, reached out to Giant Eagle in Liberty. Myers said the initial discussion for this service took place last spring, and Giant Eagle was the only grocery store offering curbside and delivery services. In his opinion, this will be something convenient and easy for students on campus. Louis Rendes, a senior computer information systems major, said this is a great idea and will provide options to those who may not have any means of transportation. Haley Wilbert, a freshman pre-respiratory science major, said a lot of students will be able to utilize this system. Wilbert said two of her roommates are international students and cannot drive to the store, struggling to find ways to reach a way to buy their food. Myers said there has been a great amount of growing positivity for this service and he looks forward to seeing how this will work. “It can only grow as much as we allow it to, and I hope to see this become successful for the YSU community,” he said.